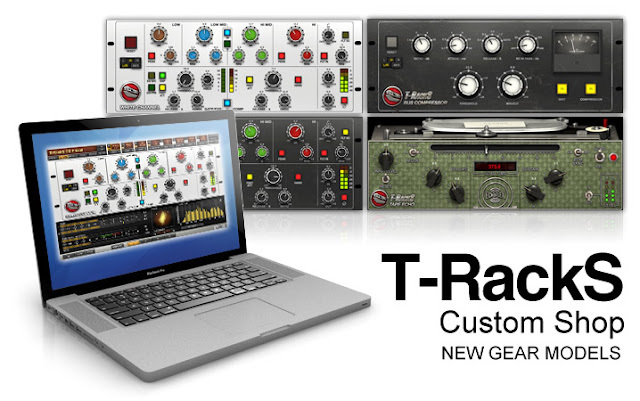 IK MUltimedia has released new plugins for their T-Racks Custom Shop. 1. The White Channel which "..is based on the EQ and dynamics section of a channel strip from a renowned large-format British console, and is the modern counterpart to our acclaimed British Channel. The board became popular in the late ‘90s, was used on many hip-hop/R&B recordings, and featured a wide bandwidth and pristine sound quality. The White Channel offers an accurate emulation of the console circuitry, allowing you to impart the sound of this classic large-format console on your own mixes." 2. The Tape Echo "...based on one of the classic tape echo units of all time, the Echoplex® EP 3. It features an amazingly accurate emulation of the sound of the original unit, including the distinctive decrease in high-end on each successive echo, which is typical of tape-echo units (and analog delay of all types). We also recreated the effect on the sound of authentic tape-machine characteristics like wow and flutter, noise and tape wear. Plus, we added some modern features that make it functionally more flexible than the original hardware unit, including stereo operation, separate delay times on L&R, and syncing to host tempo." 3. The Bus Compressor "...modeled after the master-bus compressor on one of the world’s most famous mixing consoles. Featuring a VCA circuit design, it’s often referred to as the “Glue Compressor,” for its ability to subtly “glue” a mix together. It has also been used frequently for heavily compressing drum tracks. Our model accurately captures the sound of the original hardware down to the behavior of the detection circuit, and is enhanced by some added features like a "grit" control and large main knobs, which were not on the original unit." 4. The British Channel "...modeled after one of the most widely used and acknowledged pieces of hardware in the music history. Countless hit records have been produced around the world on this British mixing console since the ‘80's, and with its ultimate flexibility and trademark sound, it’s become a true staple of music production technology. We decided to add a few further enhancements to its already powerful design, by making the Black/Brown EQ modes selectable, adding filters and I/O level controls to precisely drive the dynamics section from subtle compression to true squashing, while still maintaining the razor sharp precision of the EQ and the channel's overall sound faithful to the original. We’ve added a sleek new look to the latest version, which makes navigating its controls even easier." "The new T-RackS Processors are available for purchase now in the T-RackS Custom shop, using Custom Shop gear credits, with prices ranging from 60 to 120 credits each. Gear Credit Packs start as low as $19.99 / €15.99 (for 20 credits) and go up incrementally to $499.99/€399.99 (for 1,000 credits)."